A.J. Calloway of Extra recently interviewed Trump on a series of topics, ranging from what he plans to do, if elected, on his first one hundred days as president to what is his favorite movie. During the "rapid fire" portion of the interview, Calloway asked Trump to name his "two favorite books," to which Trump replied by citing his own published works. Specifically, he mentioned The Art of the Deal, which was published in 1987, and Surviving at the Top, which was published in 1990. "I love books, I love reading when I get a chance to read," added Trump. In August of last year, then Republican primary candidate Trump told a crowd of about 2,800 at a campaign rally in Birch Run, Michigan that the Bible was his favorite book, noting that The Art of the Deal was his second favorite. "It's my second favorite book of all time. Do you know what my first is? The Bible! Nothing beats the Bible," stated Trump, receiving applause for his answer. Trump then proceeded to garner criticism for his initial refusal to answer which verse of the Bible he considered his favorite. In April, Trump told the press that his favorite verse was the famous Exodus passage about giving "an eye for an eye" in punishment for misdeeds. "And some people — look, an eye for an eye, you can almost say that. That's not a particularly nice thing," explained Trump to WHAM 1180 AM radio earlier this year. "But you know, if you look at what's happening to our country, I mean, when you see what's going on with our country, how people are taking advantage of us, and how they scoff at us and laugh at us." Already some critics have taken note of the Bible omission from Trump's answer to Calloway's "rapid fire" question on favorite books. Jameson Parker of ifyouonlynews.com wrote a piece published Wednesday wherein he called Trump a "narcissist" for his answer to Calloway. 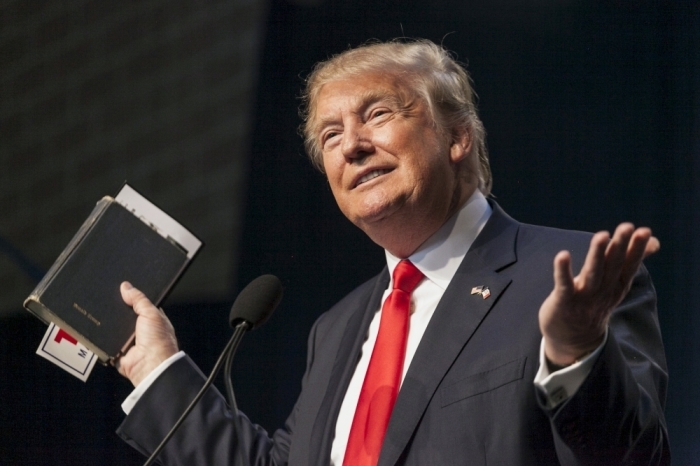 "In August of 2015, while trying desperately to convince Evangelical Christians that he would be a better choice for president than the laundry list of other potential Republican candidates, Donald Trump made the outrageous claim that his favorite book was the Bible," wrote Parker. "Now that Trump is the nominee and Christian conservatives have stood by him despite his disgusting hate campaign and torrent of sexual assault allegations, he's apparently feeling a bit more confident. He doesn't need to fake it anymore. It was fun while it lasted!"